So I picked up Sheridan Le Fanu’s ‘In a Glass Darkly’ last week. I stayed up late and finished reading it yesterday night. Isn’t it fun to read a horror story in the middle of the night and imagine and sometimes actually hear all kinds of strange sounds outside? ‘In a Glass Darkly’ has five short stories. Three of them are really short stories. One of them at around a hundred pages is really a novella. Another at around seventy pages is between a short story and a novella. They are case histories taken from the papers of Dr.Martin Hesselius, a scientific doctor who investigates strange incidents and psychic phenomena. The first three stories follow this theme more or less. The first story ‘Green Tea’ is about a priest, who one day sees two eyes following him and then sees an outline of a monkey. This monkey doesn’t seem to be visible to anyone else. This monkey keeps following him, enters his house and stays there, and one day starts speaking to him. It disturbs him, doesn’t allow him to work, interrupts him when he is giving a talk to his congregation and tortures him verbally. This priest meets a doctor and asks for help. Whether the monkey is a real thing or is a product of the priest’s imagination, and what happens to the priest forms the rest of the story. The second story ‘The Familiar’ is in some ways similar. In this story a former navy officer walks on the streets late in the night while coming back from his friend’s place and he hears footsteps after him. He doesn’t see anyone. This strange thing starts happening everyday whenever he walks through a particular street in the night. Then he gets a letter warning him not to walk in the street. The torture that these footsteps give increases by the day leading to some disastrous consequences for the officer. In the third story ‘Mr Justice Harbottle’, the judge of the title is ruthless and influences juries and lawyers to get his way. But, unfortunately for him, one day he gets a letter that he has been guilty of doing that and he will be prosecuted against and if found guilty he will get the death penalty. The judge has a dream in which he is prosecuted against and is found guilty and a date for his punishment is pronounced. Is it all a dream? Or will the judge be really punished? We know more about this when we read the rest of the story. The fourth and fifth stories in the book are different from the first three. In the first three stories it is sometimes not very clear whether the strange events are actually happening or are the product of the main character’s imagination. Sheridan Le Fanu is deliberately evasive about it. In the fourth and fifth stories strange events do happen and either there is a logical explanation for them or there are clearly supernatural elements involved. Also the fourth and fifth stories are closer to horror stories than explorations of psychic phenomena. The fourth story ‘The Room in Le Dragon Volant’, at around a hundred pages, is the longest story in the book. In this story, a young man goes to Paris to experience the pleasures of the city. He meets a mysterious person on the way and both of them make the journey together. This mysterious person who says that he is a Marquis says that he will help the young man make the most of his time in Paris, though he himself cannot join in, for most of the revelries. On the way to Paris, in an inn, the young man has an opportunity to help an odd couple – an old man who is a count and his young and beautiful wife the countess. The young man falls in love with the countess, at first sight. Then he meets a friend of the countess at a masked ball in the outskirts of Paris. And this friend tells our young man that the countess likes him and would like to meet him. And strange things start happening from then on. The fifth story ‘Carmilla’ is narrated by a young woman who is living with her father in a castle. One day they have some unexpected visitors. A noblewoman and her daughter have a problem in their coach and the daughter is not well. The noblewoman leaves her daughter at the castle under the care of the narrator and her father. Then strange things start happening in the castle. In the night when the narrator is asleep, she has a dream that a strange creature has entered her room and hovers around her and then she feels a sharp sensation like two sharp needles being inserted near her throat. You can guess now what kind of story this is – it is a vampire story. Who is the vampire and what happens next, and whether the narrator and the peace of the castle survive these strange events form the rest of the story. What a fascination a title exercises upon the imagination! I do not mean on that of snobs or moral flunkies. Superiority of rank is a powerful and genuine influence in love. The idea of superior refinement is associated with it. The careless notice of the squire tells more upon the heart of the pretty milkmaid than years of honest Dobbin’s manly devotion, and so on and up. It is an unjust world! What a fool I was! And yet, in the sight of angels, are we any wiser as we grow older? It seems to me only that our illusions change as we go on; but, still, we are madmen all the same. A man young, handsome, generous, brave as you, can hardly be rich. 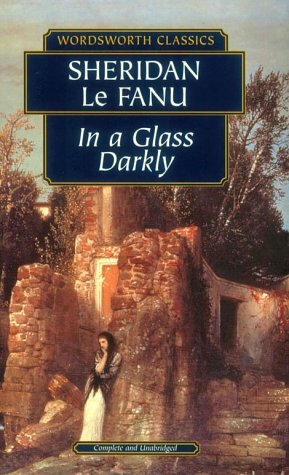 ‘In a Glass Darkly’ is my first Sheridan Le Fanu book and I liked it very much. It was interesting to read different kinds of stories in one volume – three stories on psychic phenomena, one story where strange events happen which have logical explanations and another which is a vampire story. My favourite story out of the five was ‘Carmilla’. ‘The Room in Le Dragon Volant’ was a close second. I am glad that I stumbled upon Sheridan Le Fanu’s book and got to read it for Irish Literature Month. Many thanks to Mel U for hosting Irish Literature Month. Have you read Sheridan Le Fanu’s ‘In a Glass Darkly’? What do you think about it?